A couple of weeks ago I was fortunate to take a week long workshop at the Texas School of Photography and as usual, it was fun-filled and hectic week! 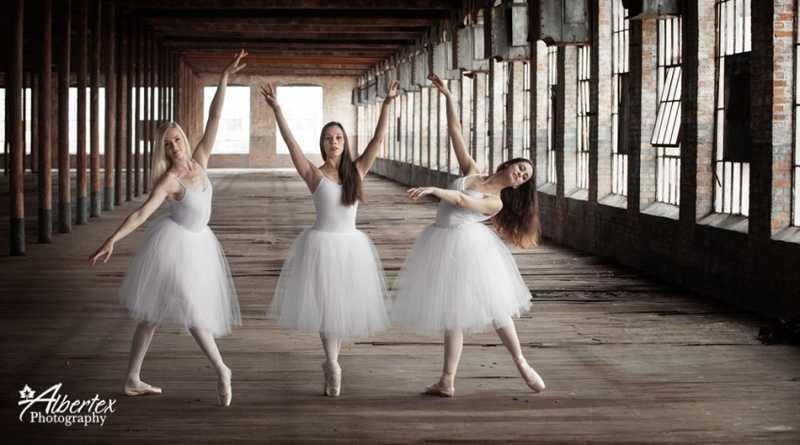 One of my favorite activities was the morning we spent at the McKinney Cotton Mill with 3 professional ballet dancers. Here are some of my favorite images – hope you enjoy! Last fall we got to travel to one of our favorite places to shoot weddings – New Orleans! Bill and Angelica live in the Dallas area but share a deep love for New Orleans, so when they started planning their dream wedding it only made sense that they plan a destination wedding in their dream location – St Louis Cathedral on Jackson Square! They worked hard to make sure all of the guests received a true feel for the city – from traditional Second Line walk through the French Quarter to the King’s cake at the reception, they did it all. This was the first time we have had the opportunity to photograph a Second Line walking through the French quarter – LOVED IT!! And so very Nawlins! Now on to the reception venue, the Louisiana Swamp at the Audubon Zoo – who wouldn’t want to party amidst the alligators? Another New Orleans must – the charm pull.. I don’t remember what song was playing, but I’d be willing to bet that it was either Journey’s or Bon Jovi – they get the best air guitar and lip syncing at most weddings. We are starting off the new year with Caitlin’s stunning bridal session. I can’t tell you how much I LOVED her dress, and Marty Leonard Chapel was the perfect venue to show it off. Enjoy! As photographers and artists we are always looking for inspiration – sometimes it comes from our fellow photographers, sometimes it comes from our own introspection, but often it comes from the people around us. Over the years, the one thing we are constantly reminded of is that the world is full of inspirational, joyful and enriching people and experiences and life is better when we keep ourselves open to these experiences and maintain a positive attitude. We recently had the great pleasure of photographing Angelica and Bill’s wedding in New Orleans and part of what made this an amazing experience (other than eating all of the yummy Nawlin’s food!) was getting to know their families. One of our favorite things about photographing weddings is that we are a fly on the wall at a very emotional event in peoples lives and we become immersed in their families for a brief moment in time. We knew Angelica & Bill’s wedding would be extra special because not only does Angelica have 3 sisters who mean the world to her, but her sister, Ana-Alecia, is battling cancer and instead of dwelling on the negative, they have chosen to celebrate love and life and enjoy every moment. We will be blogging more of Angelica & Bill’s beautiful wedding in a few days, but today we want to do our part to celebrate and share Ana-Alecia’s positive attitude and hopefully she will inspire some of you as much as she and her family have inspired us. I’m sure many of you have seen Ana-Alecia’s video that went viral last week, but you will now have a chance to hear her story on the Ellen Degeneres Show, tomorrow Tuesday November 1 2016. Please join in, share her message, and stay positive! Zoe graduated this past weekend so what better way to celebrate her graduation than a post with some of our favorite photos from her session. Congratulation Zoe! We just returned from the Imaging USA convention in Atlanta and what an amazing trip! Like any industry convention, it was a chance to see new products, meet up with old friends and make some new friends, and most importantly, take a few classes from our fellow photographers on the new trends and techniques in our industry. The high point for us was that Bill received his Photographic Craftsman degree at the Imaging Award and Degree Ceremony! He has been teaching PPA Super 1 Day classes for 4 years as well as a class for the Houston PPA Guild, so combined with his regular attendance of the Imaging USA over the past 10+ years, he had officially earned enough merits to qualify for this degree. Bill’s degree was present to him on January 12 2016 by PPA president Michael Timmons and Bill’s mentor, Dennis Hammon. He will wear it proudly at all future PPA events. Upon receiving his Photographic Craftsman degree, Bill was granted membership into the American Society of Photographers and we attended the ASP Gala on Monday night. What a great time we had! Nina Barabash - CONGRATULATIONS, BILL!!! WE KNOW YOU WORKED HARD OVER THE YEARS TO ACHIEVE THIS AWARD… WELL DONE! MAY THE FUTURE BE EVEN BRIGHTER! Another successful Star-Telegram Bridal show has come and gone and we are tremendously grateful for everyone who came by to see us! Our booth was pretty busy most of the day so if you didn’t have a chance to talk to us, drop us an email and we will tell you all about our show specials! Congratulations goes out to Deborah who is getting married in September, she has won a free engagement session! We are awesome and we love what we do - you should get in touch!